Many things were civilized about today’s ride to Franschhoek: the 8am start, not only an hour later but lighter, and with much less traffic; a beautiful day with sunny blue skies; a relaxed and friendly pace in our small group of mid-week riders. 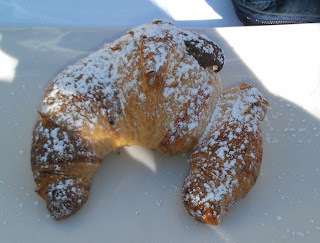 Top of the list though has to be the midway coffee stop, and very specifically the excellent chocolate filled croissants. I need to backtrack at this point and explain that on our last ride to Franschhoek I foolishly let John guilt me out of ordering one. Excellent as the bran muffin was on that occasion, it left me hankering after a croissant ever since. The Betty’s Bay coffee shop makes a great coffee, but on our last trip out that way they only had muffins. So today, nothing was going to guide me away from some seriously loaded patisserie. Fortunately, it didn’t disappoint – fresh, light and delicious. The perfect accompaniment to a decent cappuccino. The ride back was a joy – the wind which had slowed our progress into Franschhoek was firmly on our backs and made for easy riding back to the turn towards Helshoogte. On the steady rise up through Pniel, the day warmed noticeably, and with the strenuous and sweaty final climb still ahead of us we stopped to shed the last of layers of wind protection. My legs just didn’t have any drive in them today – Sunday’s 90km DC ride, followed by Monday’s hamstring exercises in the gym had left my legs heavy acheing. I just about managed to cling on to Penny’s wheel through to the summit of the pass, but there was no sprint left in the tank for the final stretch. The ride and day were far too nice for that to bother me though. We kept up a nice steady pace through Stellenbosch and back to Somerset West and the ride was over all too soon. A great last ride before our vacation, one that leaves me looking forward to a nice break and the DC training programme kicking off in earnest when we return.